The YFZ 450R air box cover is recommended to replace a no lid application. It will give you the open box performance you desire with the closed box protection that's needed. 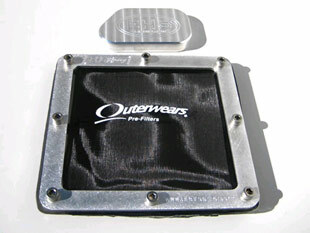 Notes: For maximum performance increase and tunibility we suggest combing this lid with our Bullet Box for the YFZ 450R. Or the use some type FI controller is highly recommended. The EHS airbox lid will also greatly improve how clean your filter stays compared to when you are forced to run with no lid at all. The material is specifically designed by Outerwears for EHS; all edges are tapped to prevent fraying or tearing. 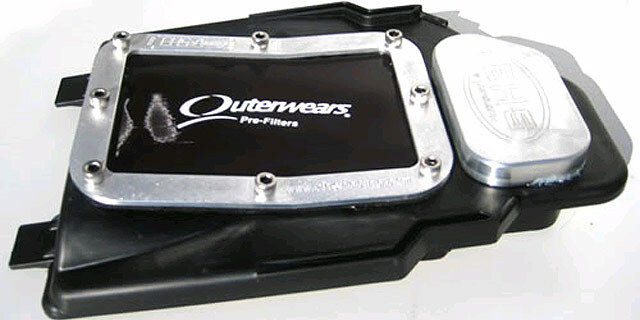 The filter is made from a water resistant material, so it will keep almost all water out of your air box. Cleaning is super easy, just take the whole cover off and wash it under the sink. All aluminum plates are CNC milled for exact precision with EHS RACING engraved in every one. We have multiple color options to choose from either filters, or anodized plates. Notes: We recommend EFI controller. Available in filter color: BLACK, RED, BLUE, and YELLOW . Available in Plate color: BLACK, RED, BLUE, or ALU SILVER . The dyno chart above shows the stock horsepower in blue.. EHS Air filter kit on the air box is shown in red.